Day 1: New house, yaaay! Day 2: New house got broken into, booo! Seriously. Who cleaned the shitter out on our parade? Not a nice way to welcome us to the hood, Lake Worth. Ahh, but I don’t take it personally. Some people step in poo wearing Christian Louboutian shoes, some get their house broken into. Tomato, tomatoe. And the Palm Beach Sheriff’s department has been lovely about the situation. The officer that responded was friendly and professional, and the next day JP received a follow-up phone call from the detective working the case – plus, she sent an email to introduce herself to me. Unexpected, but welcome. At least we didn’t have a very smart thief – the damage could have been worse. Nonetheless, we are now sans computer, awesome underwater digi cam and a wedding band 😦 What’s more, Mr. Hyde is super stressed (not to mention the other Mr.). New location. Burglary. Greeeeaat. You know it’s summer when the 4-day weather forecast is: humid-hot-muggy-warm. Ahhh, summer. I felt the humidity just typing that. I know I wrote that letter to Humidity awhile back (here it is), but…that was then. This is now. Anywho, summer means sun. 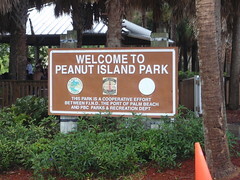 And a great place to catch some sun – Peanut Island. It’s the teeniest little island sitting in the Intracoastal, close to the Port of Palm Beach, just north of the bridge on Northlake. If you’re in Palm Beach County, this is a must-do! Boaters, paddle boarders, kayakers, canoers…everybody that’s mobile via water is there! Even the dogs! Everybody is there to have a good time. Makeshift volleyball nets are up. Footballs are flying around. Rays are swimming under your feet. Burgers are being grilled. 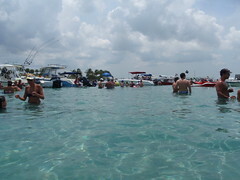 Oh, you can’t forget the awesomeness of that crystal blue, clear water! It’s a great reminder that we’re back in South Florida. Good times, good times.